This is a remote control which is using sound to switch a load. Clap your hands twice in a time window and the light goes on like magic. A microcontroller allows a bit more control and error handling than conventional circuits. A microphone and the transistor pre-amplifier convert the sound to an electrical signal. This is basically the clap frequency of more or less 2 kHz which is measured with TC0 at input PB2. TC1 provides the time base for the whole circuit and here uses 100 ms gate time to measure the clap frequency. The red led3 turns on when a sound is present. Now the number of pulses which are counted with TC0 are compared to two thresholds. This should avoid a false trigger and seem to work quite well. The definition .equ tooshort= 8 means count pulses are too few, may be a spike only, and .equ toolong= 180 means count is too long, it could be noise etc. TC0 counts between 8 and 180 are considered a valid clap signal and set a flag for the first accepted clap. The blue led1 turns on. Now it waits for waitclap= 60 i.e. 600 ms then listens for the second clap. The time window is cwindow= 250, a window of 2.5 sec to receive the 2nd clap. If this 2nd is also a valid clap then the output PB4 is turned on and the relais switches. To avoid switching by the click of the relais there is a blocktime= 4 meaning 4 seconds sounds are blocked when the relais has switched. During this time the red led3 is blinking, led4 turns on. Now, if you clap twice again the relais turns off. Lights off, magic again. These parameters can be changed in the program according to your own experiments. The waitclap time could be a bit shorter. The circuit diagram of the clap switch. S1 is an optional manual push button and can turn the relais on or off. When the program is waiting, the white led2 is on and the blue led1 blinks once per second to show it is ready. This trick to switch 2 leds witch one output pin works best with white and blue or green leds. I have built different versions, in the one above PB4 is driving a power FET. 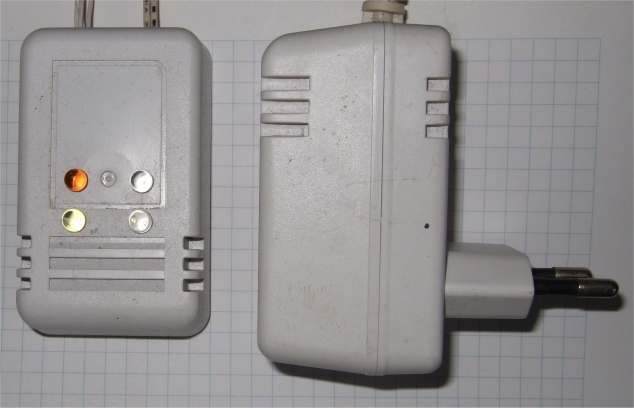 The FET will turn on small 12V led lamps directly, no relais is used. That is why it can fit in a small box. The power supply is a simple wall plug for 12V DC and 300 mA. 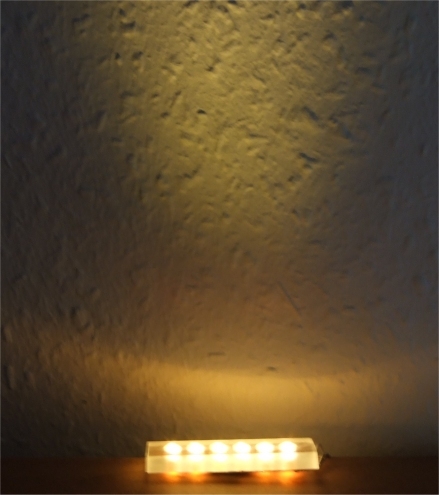 One of the led lamps with sun-white leds. All children will like this clap switch, it's fun to use. m2:						; cnt too high, noise etc.